Howdy Sugar Fans!! We are currently looking for a new member to join The Sugar Nellie team. As you know, Funky Kits is the home to all Sugar Nellie both rubber and digi and with the range growing we need a fab team to keep you continually inspired and to promote the Sugar Nellie name. So on to the important things. We do have some requirements for any newbies joining our team and if you feel you can meet the requirements, then this may be for you!! You must be able to commit to a 4 month term initially - this will be reviewed at the end of the term. You must be able to complete projects on time and add them to our DT page. You must post your project on your own blog and the Sugar Nellie Blog each week. You must be able to take a good photo of your project. You must have an active blog and Facebook account - the DT stuff is managed on our Facebook page. Although we are based in the UK, that doesn't mean you can only apply if you are in the UK. We would encourage all our Overseas Fans to apply as we need to spread the Sugar love all over the world. We want newbies that love all things Sugar Nellie and they will be great at promoting the products through their own work. So if you need the requirements and are interested in joining the team, then what you need to do to apply is following the instructions below. 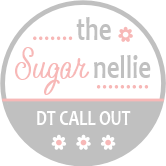 Display our DT Call Out badge on your blog as well. This DT Call will close on 30th April 2015 and the successful applicant/s will be notified soon after this date in time to start shortly after. If you feel you can't commit to a weekly posting, then why not try out for our Challenge blog DT Call over at The Sugar Bowl.